Qualitec which is a company of NOZOM GROUP owned by the KABBANI family, is 1 of the leading direct sales company for standard sheet metal products in Egypt. 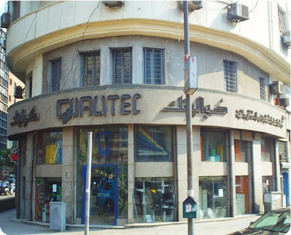 Qualitec is established to be an outlet for Technological & Electrical Systems Co. in the center of Cairo, in front of the Egyptian engineers syndicate and near the main Cairo railways station. The company has been founded in 1995, and is selling various sheet metal products like cable supporting systems, couches, electrical cells, electrical panels, elevator doors, garbage boxes, keys panels, lockers, mail boxes, storage units, trolleys and TV holders. Qualitec is carrying its commercial and industrial services with sales specialists from the morning till late hours of the day, 7days over 7.